This is my friend Fred pictured left holding two silvers, the size difference is obvious between the larger Hob & smaller Jill. 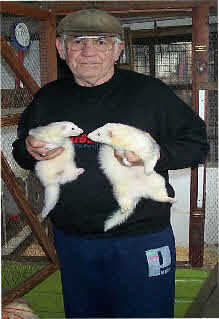 Fred is highly knowledgeable of ferrets and field sports. I know him from work on British Rail and have kept in touch since he retired. 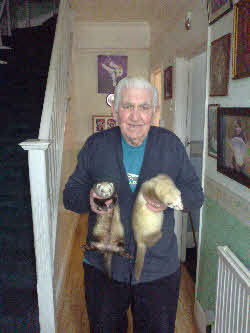 As of 2013 Fred has ceased ferreting due to reduced agility in old age, during 2014 he donated his remaining two ferrets to me, pictured right . Earlier this year (2006) Fred's family, as birthday treat arranged for him to visit the farm in Wales that he and his brother were evacuated to during the second world war. Fred visited the farm and surrounding area accompanied by a daughter. He has spoken to me since the visit about how things are now, explaining to me how he learnt how to work ferrets and use snares to catch rabbits to sell, and where he gained his enthusiasm for all country pursuits, but when he remarked he had met with “old Harry,” who is now ninety-two years old and had taught him how to use ferrets and catch rabbits, I was gob smacked.